Servus Slab font is a font with very interesting and quite special idea behind it. Its author, the Polish designer Michał Jarociński began working on it immediately after the birth of his son, hence the name – Servus which in Polish means “Hello”. His concept was to create a font that would symbolize the growth of a child. It follows the pattern of life – starting with Thin and Narrow weights and then gradually turning to Black and White. 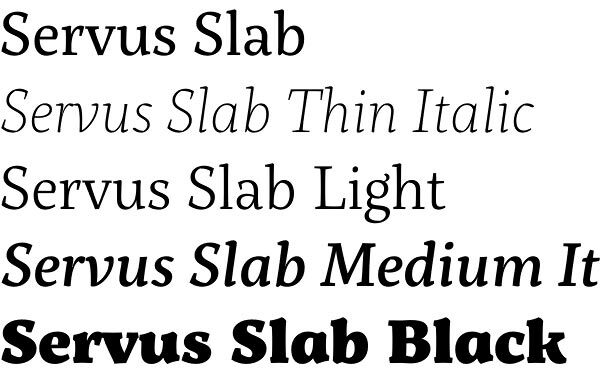 All in all, Servus Slab offers nine weights with their corresponding Italics. This huge variety would suite any taste and will serve any need – titles, display, headlines and longer texts. 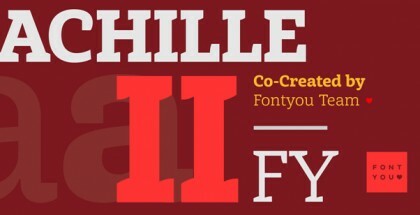 What is more – a wide range of OpenType extras are included – fractions, numerals, ligatures, small capitals, etc. Support is provided for all languages that use Latin alphabet. And finally – what we consider to be the best feature of this typeface family – dedicating the font to his son, the designer incorporated in it all the love he is capable of! Servus Slab font is released by Dada Studio – an independent type foundry, based in Warsaw, Poland. 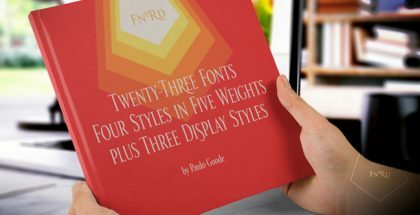 It is focused on creating unique contemporary fonts with great attention to detail. Other studio’s typefaces include: Sharik Sans font, Clavo font. Get Servus Slab font and enjoy the ultimate dedication behind it!